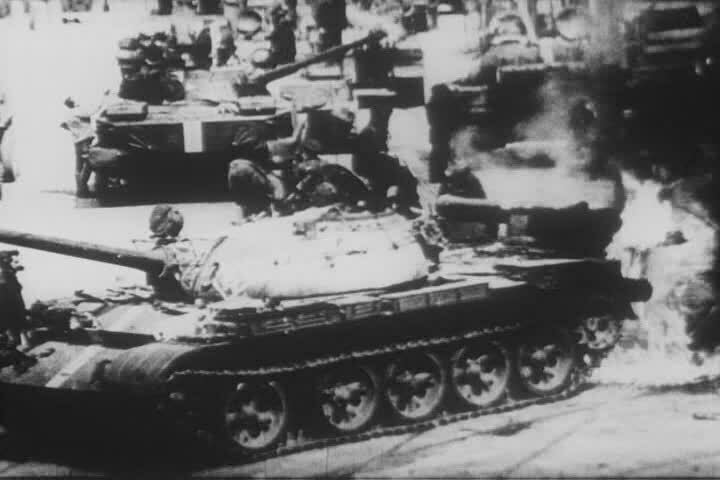 On the night of Tuesday, 20 August 1968, Soviet military units crossed the borders of Czechoslovakia: at 1.30 a.m. on 21 August a message was delivered informing Prime Minister Harold Wilson, that the Czechoslovak government had asked the Soviet Union for ‘fraternal assistance’ in the face of a threat to the Socialist order. Soon, with the help of East German, Bulgarian and Polish ground forces, Czechoslovakia was firmly under Soviet control. Many people—in Moscow, as well as in London and Washington—had calculated that the Politburo might draw back from the brink. Later, a general consensus formed that the reform movement spearheaded in Czechoslovakia in 1968 by Alexander Dubcek, First Secretary of the Czechoslovak Communist Party, had pushed the Soviet regime beyond the limits of tolerance. 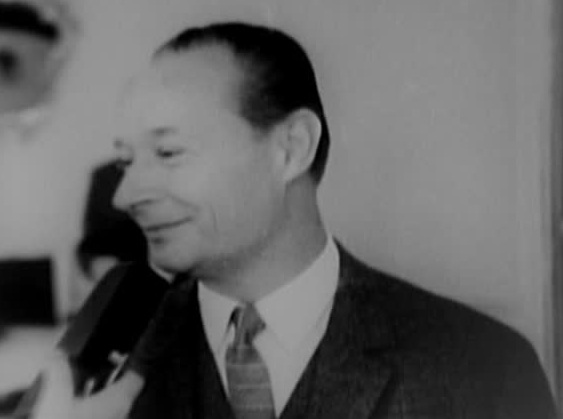 Though Dubcek had been educated in the USSR, understood the system and assured Moscow that his programme of free socialist development, toleration of dissent and the secret ballot would not affect external policy, the Prague Spring appeared an unacceptable threat to Communist solidarity. But the decision to invade was a complex one, as the context shows. After the end of World War II the USSR sought to secure its position as a victorious superpower by dominating most of Eastern Europe. This was defensive as well as offensive, since the Soviet regime distrusted what it regarded as American imperialism, and saw Western security arrangements like NATO as a threat. Tight control over the Eastern bloc was essential, particularly in the 1960s at a time of slow economic growth and industrial discontent in the USSR. Yet meanwhile, the Soviet Union was pursuing a parallel policy of engagement with the West in areas like trade, proposals for a European security conference and negotiations with the USA for a non-proliferation treaty. This twin-track approach to policy produced some initial ambiguity in the Eastern response to the reform movement in Czechoslovakia. Western policy was also conflicted. London and Washington rejected Communism and regarded Soviet overtures with caution, suspecting them of seeking to drive a wedge in Western security (just as Moscow suspected Western wedge-driving in the East). But in a Presidential election year the US government was disinclined to get involved in Eastern European affairs, and the ongoing war in Vietnam occupied political and military attention. Washington was keen for Britain to act as intermediary with Hanoi via Moscow, yet suspicious of any Anglo-Soviet rapprochement; dismayed by British defence cuts while unwilling to ease their financial burdens. 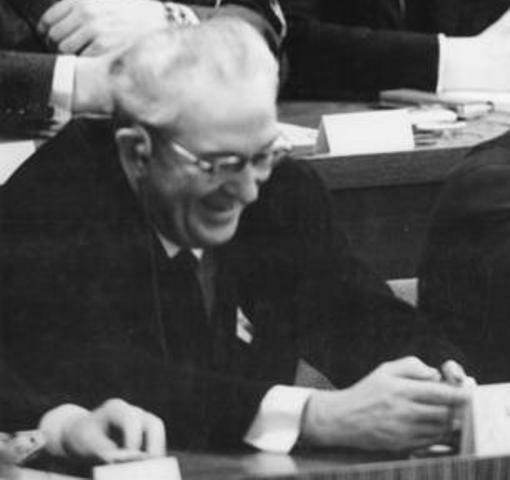 British policy was equally conflicted: a meeting in May 1968 of diplomats serving in Eastern Europe agreed it was important to ‘increase strains’ on the Soviet bloc by promoting bilateral ties, but ‘not at the expense of the Soviet Union’ (whatever that meant). The West accepted, however, that events were out of their control. In Moscow, Soviet leaders were beginning to suspect the same thing. Since the beginning of 1968, there had been worldwide protests against government action or inaction, internal repression and external aggression, in the name of freedom, peace and self-determination. Young people in particular were making their voices heard forcefully. In the UK and USA, as well as in Germany and Italy, there had been widespread and sometimes violent demonstrations against the Vietnam War; in France, a student revolt in May produced a national upheaval that almost brought the country to a standstill; in Northern Ireland, there were violent demonstrations against British rule; in Brazil, there were protests against a military dictatorship. None of these posed much threat to the Soviet Union: indeed, unrest in the West was welcome to a regime that felt threatened by Western solidarity. But protests in Poland and Yugoslavia were a different matter; and if the contagion of unrest spread to East Germany, the spectre of an increasingly powerful West Germany eroding the supremacy of the Eastern Bloc would arise. In addition, the violence of Mao Zedong’s enforcement of the Cultural Revolution in China offered to the Soviet Union, another huge and disparate country, an awful example of continuing civil conflict and the need for costly repressive measures. During the 1960s there was growing anxiety in Moscow, fuelled by KGB reports of ‘harmful attitudes’ and ‘hostile acts’ (such as listening to Western pop music),[ii] over the spread of Western influences within the Soviet bloc, through tourism, media and cultural exchanges. Soviet espionage in Western countries, particularly the UK and USA, expanded greatly. [iii] The KGB, led since 1967 by Yuri Andropov (who had played a part in the suppression of the Hungarian uprising in 1956), pushed a consistently hard line in the Politburo in favour of crushing the Czechoslovakian reform movement. Evidence of supposed ‘Western plots’ was manufactured, while up to 20 ‘illegals’, posing as Western tourists, students and businessmen, were sent to Czechoslovakia in an operation codenamed PROGRESS to penetrate and discredit counter-revolutionary groups. [iv] Despite the reluctance of President Brezhnev, Prime Minister Kosygin and Foreign Minister Gromyko, Andropov tipped the balance by encouraging fears that Czechoslovakia might fall prey to a coup or NATO aggression. In the end the Soviet leaders, like those in the West, just could not be sure what would happen if the Prague Spring continued to bloom. Insecurity and fear produced the decision to invade. The invaders did not have it all their own way, despite military dominance. Dubcek and his movement had too much popular support for the Soviets to install a puppet regime as planned; instead the reformers were taken to Moscow to be intimidated into submission, making a mockery of ‘fraternal solidarity’. 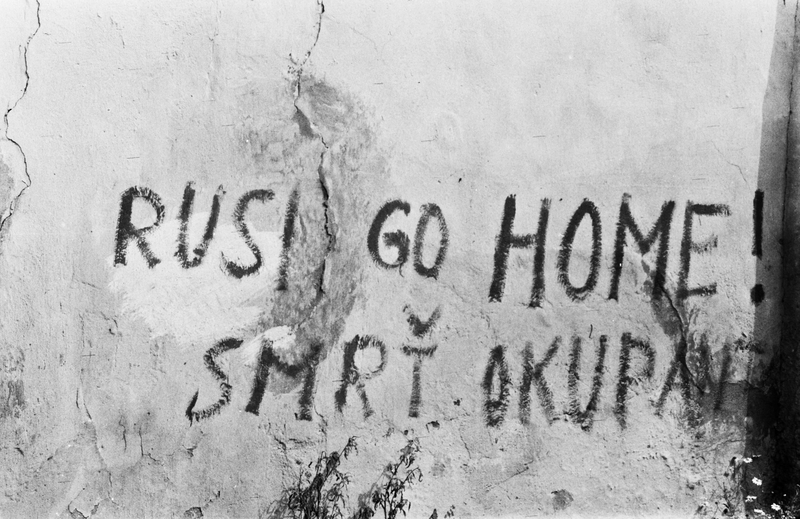 In Czechoslovakia and elsewhere in the East, the legacy of August 1968 was long-term resentment and disaffection. Meanwhile, the Soviet leaders embarked on a somewhat desperate charm offensive of détente with the West. The last word goes to Sir Geoffrey Harrison, HM Ambassador in Moscow, who in May 1968 suggested three possible Soviet reactions to the Prague Spring: (1) crushing the reform movement; (2) accepting it, while trying to limit damage to the USSR’s position; and (3) putting the Soviet regime at the head of a movement for détente in Europe. [v] In fact, the Soviet Union tried to do all three at once. [i] Moscow despatch of 30 September 1968 to the FCO, NS 3/18, printed in Documents on British Policy Overseas, Series III, Volume I, No. 15. [ii] See Christopher Andrew and Vasili Mitrokhin, The Mitrokhin Archive: The KGB in Europe and the West (London: Penguin, 1999), Chapter 15, Part I: ‘Crushing the Prague Spring’. [iii] See DBPO, Series III, Volume I, Britain and the Soviet Union 1968-72. [iv] The Mitrokhin Archive, Chapter 15, Part I. [v] DBPO, Series III, Volume I, No. 10. I wonder what the parallels of this invasion look like compared to Ukraine invasion and whether the indicators and warnings outlined in the Nicoll Report – a previously classified document written to assess the performance of the British Joint Intelligence Committee in warning about foreign acts of aggression could have proved of use in the Ukraine situation!